Students will be able to use one-to-one correspondence to count Christmas objects up to 10 and countdown from 10. Once the book is done, flip back through the book counting down the objects backwards. Have students hold up both hands. Have students put down one finger at a time as they count backwards from 10 to zero. Pass out the Count, Trace, and Color: 10 worksheet to every student. Count all of the candles as a group, pointing to each candle. Then count all of the candles counting backwards from 10. Give students a few minutes to trace “ten” and color in the candles. Pass out the Count, Trace, and Color: 9 worksheet to each student. This time, divide the class into partners or small groups and have them complete the worksheet. Inform the groups to count the number of objects forward, and then count backwards from nine. Come back together as a group to debrief. Did students have any problems completing the worksheet and counting forward and backward from nine? Explain to students that they will now each choose one of the remaining worksheets (numbers 8-1) to try completing on their own. While students are working, any adults in the room should be circulating, answering student questions, and checking for understanding. Early finishers should be encouraged to create their own 12 Days of Christmas Counting books using some of the other worksheets or creating their own original worksheets. Playing quiet music in the background can help to reduce noise from talking and set a peaceful working mood. Working with partners can help to scaffold this activity. Have number lines visibly posted as a backward counting aid. Encourage students to create their own worksheet for numbers greater than 10. Students can also be encouraged to make a backwards number strip counting down from 20. 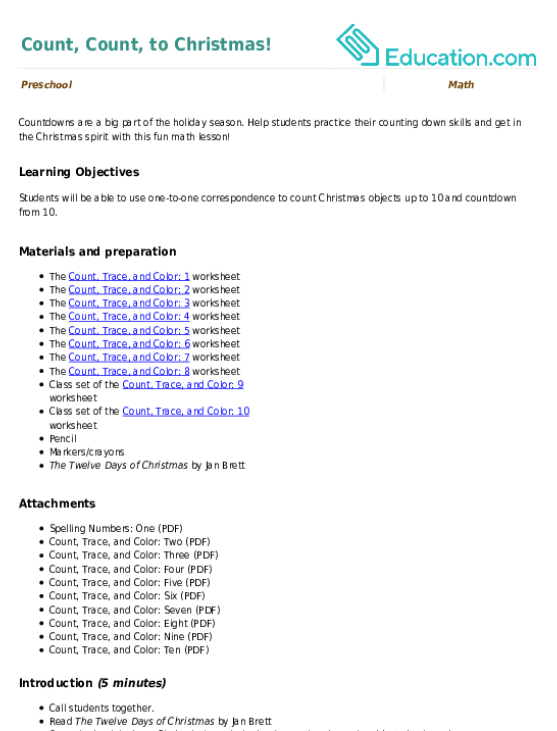 Ask students to count the number of objects on their page. Make observational notes if they can count them forward and backwards. Take anecdotal notes about student contributions during class discussion and their comfort level with numbers and counting. Hang up students’ sheets counting backwards from 10. Point out to students how each number sheet has one less holiday symbol on it. Discuss student choice selections: Was it hard to spell their number? Why did they choose the number they did? What number was chosen the least? What number was chosen the most? As a group, design a sheet for the number zero. Hang this at the very end of the backwards number line. Help students practice their counting down skills and get in the Christmas spirit with this fun math lesson! Can your preschooler sort and count the jumble of gingerbread men, snowmen, candy canes and mittens? This worksheet will help your child learn to count the number 2. 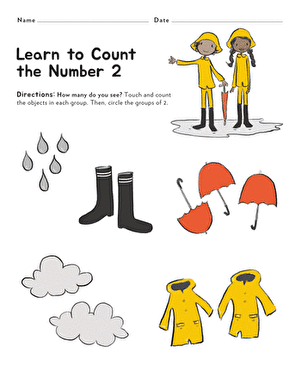 Can your child count all of the different items of rain gear? Counting is not that boring when it's all about Christmas! Add a bit of jolly holiday cheer to your child's math practice with this merry worksheet. 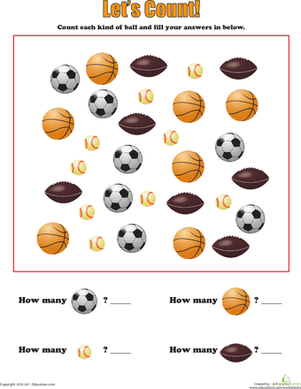 Help your sports-lover make learning to count more fun with this math printable. Your child will count, and learn to group and identify by characteristics.